Let the good times roll at your next seated dinner with a festive Mardi Gras carnival theme. Creating a Mardi Gras tablescape is easy. Start with the traditional Mardi Gras colors of purple, green and gold. Add in inexpensive Mardi Gras beads and masks. Here are a few ideas for easy Mardi Gras inspired napkin rings and table decorations for fun Mardi Gras ambiance. 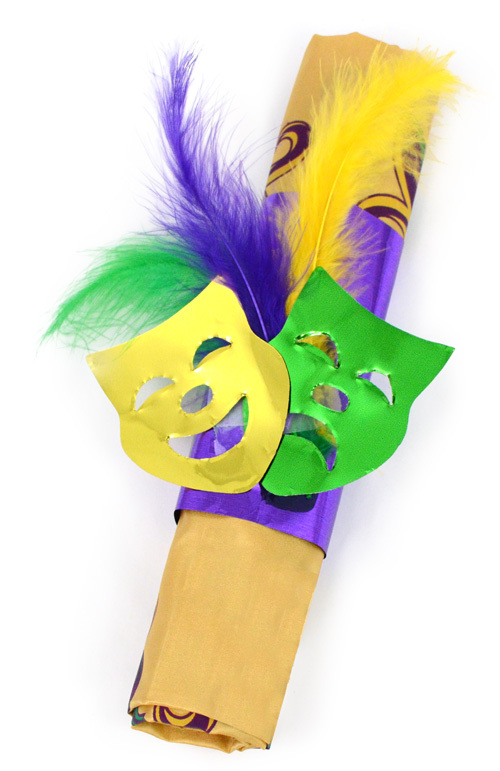 Over sized metallic comedy and tragedy mask confetti and feathers transforms into simple Mardi Gras napkin rings. Fold the napkin in half. Roll the napkin into a cylinder. You can roll the cutlery up in the napkin as well. This works very well for a buffet style dinner so guests have less to carry. The purple mylar comes in large (tissue paper sized) sheets. Cut the purple mylar sheet into small strips and wrap around the napkin. Use glue or tape to secure. Add three craft feathers in the traditional Mardi Gras colors of purple, green and gold. Lastly glue on each piece of comedy and a tragedy mask confetti. Your fun Mardi Gras mask napkin ring is complete. Metallic gold craft wire transforms into dainty crown napkin rings. Click HERE to see our tutorial blog on creating these tiny whimsical wire crowns out of aluminum craft wire. Simple green paper plates and green paper napkins rolled up look refined with the regal crown napkin ring. The simplest way to add Mardi Gras bling to your table and create an easy napkin ring is to use Mardi Gras beads. Shown here with our custom Mardi Gras bead charger. Click here for the charger tutorial. Paper purple napkins are rolled and wrapped in metallic purple, green and gold Mardi Gras beads for a simple, but festive place setting. The gold mask not only looks nice on the plate, but also is a great party favor. Repeat the same details (Mardi Gras beads, confetti and mask) along the center of the table. Cover the table with purple, green or gold table cloth. Here we used a purple faux dupioni tablecloth. Lay a contrasting color runner down the center. Place something tall along the center. Pictured are a few Standing Glitter Grass Bundles for height and drama. Scatter the extra large comedy and tragedy confetti, Mardi Gras Beads and feather masks around the table. The beads and masks are great party favors for guests to wear and take home. Standing Glitter Grass Bundle: 27"